We first saw this tiny bird in Makiling in April 2009. The race found in Makiling is flagrans. When you look very quickly it is easy to think it is the more common Olive-backed Sunbird. But in Luzon the orange belly is the first sign it is a Flaming Sunbird. In addition the back of the head of flagrans has a yellowish cast to it and it has a small orange wedge at the bottom portion of the chest surrounded by black feathers. 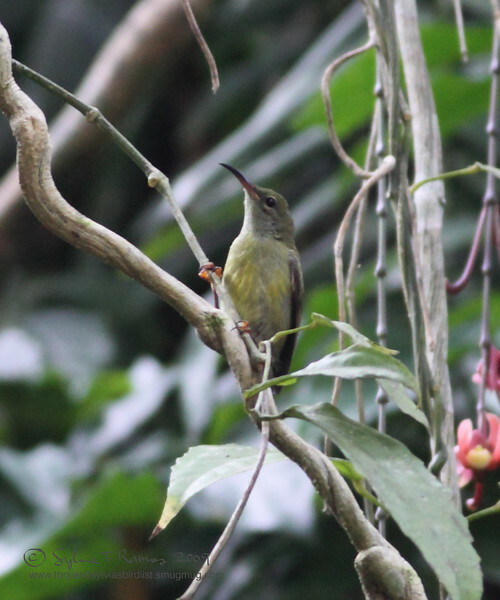 In the Visayas we have seen some Olive-back Sunbirds similar to the aurora race in Palawan. It is easy to think that the Flaming Sunbird in Negros is an Olive-back Sunbird aurora. The Negros Oriental race of the Flaming Sunbird, daphoenonota also showed the orange wedge on the upper breast but only at certain angles. But the reddish back of the head, red coloration in the back plus the iridescent blue on the top of the head make it quite distinctive. There is a proposal by Hosner, Nyári & Moyle to treat Aethopyga (flagrans) guimarasensis (incl daphoenonota) as a separate species. The proposed English name is Maroon-naped Sunbird.